Foremark Hall in Derbyshire is one of Chippendale's lesser-known commissions but judging from Sir Robert Burdett's bills to Chippendale between the years 1766 and 1774 it was by no means an insignificant one. It may have made up part of the bill invoiced by Chippendale on 4 February 1769: 'To Mr. Chippendale on account of Furniture at Foremarke, upholsterers St. Martins Lane London £100.0.0' (C. Gilbert, The Life and Work of Thomas Chippendale, London, 1978, vol. I, p. 166). A later payment to Chippendale may explain why the Burdett bills are so vague. The bill for 1 July 1769 seems to suggest that Burdett was paying Chippendale in arrears: 'To Mr. Chippendale upholsterer Londn on account of his bill - 314.14.0 he had received before £300 400 still remains due to him to clear his Bill for furniture for Foremarke House'. Anthony Coleridge made this suggestion in his article on the Chippendale furniture supplied to Foremark, and in particular the mahogany bookcase, which formed part of a large commission to furnish the house carried out between 1766 and 1769 (A. Coleridge, 'Thomas Chippendale and Foremark Hall', Furniture History, 1997, pp.136-141). 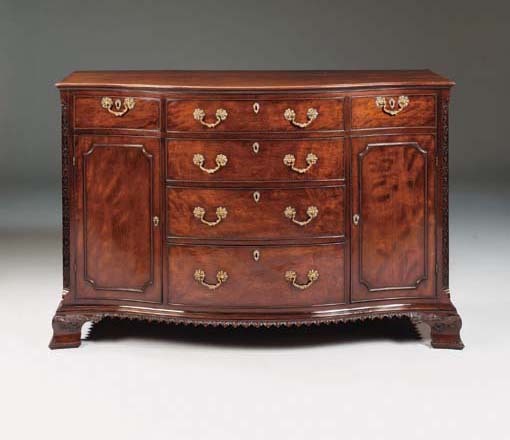 It would appear that Chippendale was supplying furniture in the mid-to late 1760s and, unlike better documented Chippendale commissions, was paid possibly two or three years after the items had been delivered. The design derives from a pattern engraved in Thomas Chippendale's Gentleman and Cabinet-Maker's Director, 1762, pl. LXIX.